There are two varieties of death - on - the - rampage movies: the kind where you instinctively root for the meat to avoid the grinder, and the kind where you cheer for the grinder. In the gory, jokey New Zealand horror programmer "Black Sheep," you're definitely pulling for the woolly flesh-eating zombies of the title. Because the sooner the ferocious mutton-chops masticate their Kiwi prey into mincemeat, the sooner the end credits will roll. "Black Sheep" isn't really baaaaad but it does get tedious after a while. Turns out, watching bloodthirsty livestock eat people is not all that much more fun than watching regular ones graze on vegetation. Without a more biting satirical edge (like its much sharper superiors, including "Piranha," "The Howling," "Dawn of the Dead" (1979) and "The Host," to name just a few examples), things get pretty dull after a while. As expected, the picture begins with a pretty, establishing shot of a rolling pasture. Fluffy sheep sweep across the placid landscape like low-lying cumulus -- if clouds could be herded by dogs. Then (surprise!) things take a quick turn for the ugly. Within minutes, a boy ax-murders his little brother's pet sheep, dresses up in its bloody carcass to terrorize the younger child, and their father dies in an unrelated "accident." This leaves us with a fair-haired little brother, Henry (Nathan Meister), who grows up to be lamb-o-phobic, and an evil big brother, Angus (Bruce Campbell -- er, Peter Feeney), who continues the family lineage through unethical genetic experimentation in the hopes that the Oldfield sheep will one day surpass the illustrious breeds (the Marino, the Romney, the Drysdale) that "young men in the land recite as they take themselves off at night." Meanwhile, it's the buffoonish sheep-hugging animal rights activists, Grant (Oliver Driver) and Experience (Danielle Mason), who unknowingly release the ovine plague through their naive ineptitude. "This isn't going to be like the salmon farm, is it, Grant?" Experience beseeches her bumbling, pony-tailed eco-colleague. "Hey," he insists, "those fish died free!" The best jokes are like that -- slipped by almost before you notice. Writer-director Jonathan King gets in some pretty good "Psycho" (1960) gags, too -- the Old Dark House with stuffed sheep heads mounted on the wall instead of taxidermied birds, the landscape covered with woolly (rather than feathery) threats, the quiet farmhouse containing the bloody bodies of victims. And there's a sheep who does a mean "Heeeeeere's Johnny!" as well. The central problem with "Black Sheep" is not that it's the kind of thing you would have seen on the bottom of a drive-in double-bill or on late-night television in the 1970s. It's that it's exactly the kind of thing you would have seen on the bottom of a drive-in double-bill or on late-night television in the 1970s. And it's the 2000s now, so the idea doesn't seem nearly as clever as it once did. What does "Black Sheep" have to add to the glorious tradition of cheesy gross-out horror comedies? Not a sausage. Like "Snakes on a Plane," the whole movie is essentially contained within the title. All the picture itself does is to repeat that concept for 87 minutes. 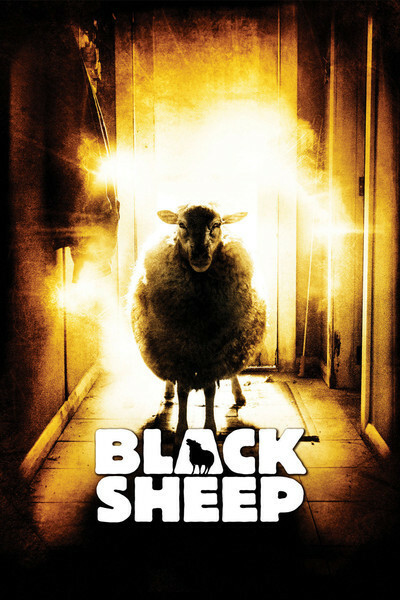 So, if you were to chant "Black Sheep," say, about 5,220 times in a row, that would roughly approximate the experience of actually watching "Black Sheep." Meanwhile, there's always "The Night of the Lepus" (1972), which not only has killer bunnies (see "Monty Python and the Holy Grail" for more), but Janet Leigh, Rory Calhoun and DeForrest Kelly, to boot. For an even more efficient use of your limited remaining life-allotment of minutes, the "Black Sheep" trailer ("The Violence of the Lambs") is available on EweTube.